Kratos emerged victorious from his war against Zeus and the rest of the Olympians almost six years ago now (I know, it has been that long), and, considering how the third game in the trilogy ended, many suspected that gaming’s angriest man had tied-up all of the loose ends and unfinished business haunting his every waking thought and strolled off for a well-earned holiday. Well, it looks like his adventures aren’t quite over just yet. Thanks to a huge deluge of concept art published by NerdLeaks – which have subsequently been published on NeoGAF – it looks like Kratos may well be returning for a God Of War 4. Not only that, but it seems ancient Greece is being traded for a more Nordic setting. 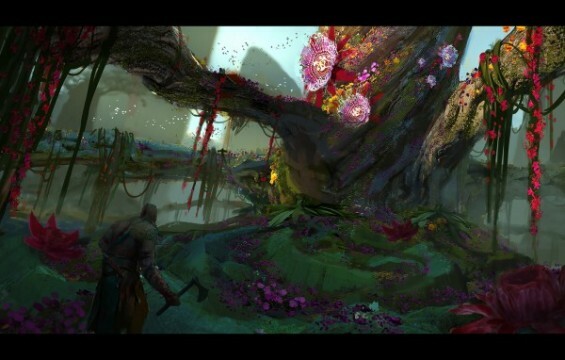 You can head over here to see all of the concept art in its entirety, and besides being greeted by an image that appears to show Kratos with a bushy beard with weathered axe in tow, the environmental art strongly suggests that we may be visiting famous sites like Valhalla and giving the likes of Thor and Odin a good beating while we’re there. That’s all speculation of course, but the concept art does strongly suggest such a setting. The validity of the art has been called into question, however, but it’s claimed that the images were sourced from an unnamed artist’s website who worked at Sony Santa Monica studios last year. Tell us, what are your thoughts on the potential existence of a God Of War 4? If the game does indeed exist, trading the Twelve Olympians for a Nordic setting could be a nice change of setting for the series, don’t you think?